Understanding Contemporary Capitalism, published today (April 3rd) sets out SPERI’s new research agenda. 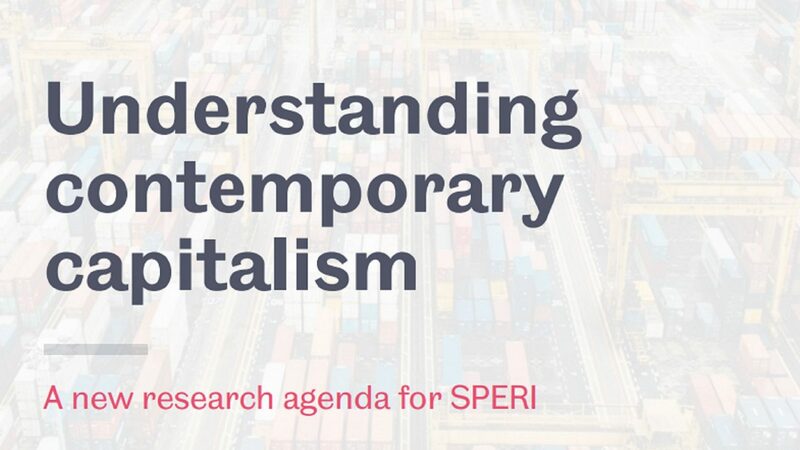 SPERI is committed to developing and promoting new analysis and understanding of contemporary capitalism and our research agenda is designed to address major economic and political challenges arising from contemporary capitalism. The new report, collectively planned and written by members of the SPERI research team, outlines our approach to political economy analysis and explains how and why our intellectual agenda is now centred around four key research priorities which each address issues and concerns at the core of contemporary capitalism. Those four research priority areas, each explored in detail in the publication, are Capitalism, Democracy & the State; Finance, Debt & Society; Corporate Power & the Global Economy, and Labour & Decent Work. This is an exciting period for SPERI and over the coming months and years we look forward to sharing more of our ideas and research with you. We welcome your views on our new research agenda so if you have thoughts and ideas to share with us please get in touch.